I moved around a lot as a kid, but I’ve spent more time in Philly than anywhere else. It’s definitely “home.” Until I was 8 it was just me and my mom. I was always interested in the arts, but I think I also ended up getting signed up for a lot of arts classes and programs as a way to keep me busy! After that I was adopted by my stepdad who, through his love of antiques, instilled in me an appreciation for all things handmade. His mom had been a dance teacher when she was younger, but went on to make her living as an oil painter, very much in the style of the Old Masters. I loved hanging out and painting with her in her studio even though I wasn’t very good at it! She also read to me ALL THE TIME, but she never chose stories based on the text. She looked for books with beautiful illustrations which really helped me understand the power art has to tell a story. I went to a tiny private high school in Vermont after my family decided to escape the city and start a goat dairy. Living so far from everything was a very isolating experience. It was a really hard transition for me. My bedroom at the time looked more like an art studio with a bed in it than a teenagers bedroom for sure. I painted, knitted, discovered stone carving, played with collage, took a photography class, went on a school art history trip to Rome. I basically did anything and everything I could that qualified as art! I went to Sarah Lawrence College in Bronxville,NY which surrounded me with artists and art lovers of all kinds. I studied art history but didn’t really create anything of my own until I studied abroad at the Instituto Superior de Artes in Havana, Cuba. There I apprenticed with Alejandro Cordobés who really helped me see what I could do by just changing the weight of a line. In got my Masters in Elementary Education at University of Pennsylvania. As part of the program we were required to write children’s books. I have always loved the illustrations of Eric Carle and Ezra Jack Keats. I bought my first X-Acto knife and started playing around with it. I loved the feel of it cutting through the paper and found that I was much better at it than any medium I’d tried before. For the first time I was able to execute my vision exactly as planned. I went on to teach for The School District of Philadelphia in a very high needs (read: poor, embarrassingly underfunded and understaffed) school. Putting so much into my students was leaving me very drained so I decided I needed to be a little selfish. I began carving out time each week that was unquestionably devoted to papercutting and it was one of the best decisions I’ve ever made. People were really responding to the work I was making so I decided to start hounding galleries for shows! Q: What exactly is hand cut paper? How did you fall into it? 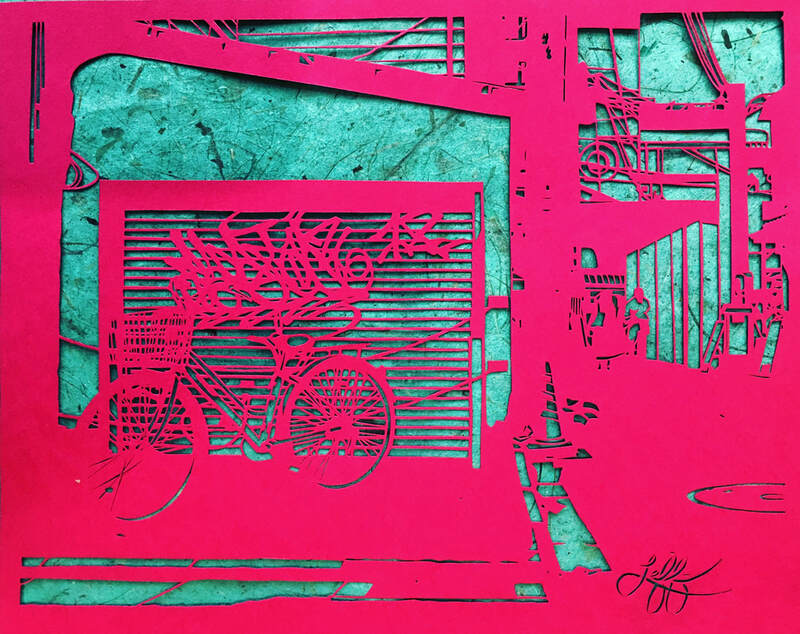 Papercutting began in the 4th century after paper was invented in China. Paper spread, via the Silk Road into Islamic countries and by the 11th century had made its way to Europe. At each stop along the way people put their own spin on cut paper. While most Americans today are probably most familiar with traditional black silhouettes or Mexican papel picado, the machine produced colorful paper flags you see hanging in bars for Cinco-de-drinko, there’s German scherenschnitte, Chinese jianzhi, Polish wycinanki and so many other styles. At its essence, hand cut paper is as simple as its name. Use anything (a knife, a scalpel, sheep shears, or tiny scissors) to cut a piece of paper and you’ve done it! I mostly started working from illustrations by graphic novelists like Will Eisner and Kim Jung Gi. I think the stories they’re able to tell with a single black and white image are pretty mind-blowing. Then I started to tell my own stories. Since moving to Maryland I’ve been feeling nostalgic and a bit homesick. Lately I’ve been working a lot from photos I’ve taken in Philly, but also from other cities and countries I’ve traveled to including Tokyo, Yokohama, San Juan, and Tel Aviv. All of my work is hand cut from a single sheet of paper using an X-Acto knife. After I take a photo I format it, print it, and then tape it down on a piece of art paper. I often have to draw on top of the photo to ensure that each piece of the image is connected to another and that the paper will maintain its structural integrity. I then cut through both layers, playing with the positive and negative in order to show the depth of the original grayscale. I then remove the “stencil” layer. Unlike most papercutters I also cut my signature. I’ve never liked the idea of signing in ink or pencil. I love that when finished, my art is still just a sheet of paper. Q: On average, how long does it take for you to complete one project? There’s a HUGE range. Some of my smallest cuts may only be 3-5 hours. My largest cuts (generally 20×30”) can take around 100 hours. Those can take a month or more to complete because my eyes and wrist can only make it so long in one sitting. Last week my doctor seemed very put off by having to tell me that I have arthritis despite being 29 years old. Q: I would imagine the process is very intricate with a lot of equipment and patience. Can it get frustrating sometimes? There’s really very little equipment, which makes it a super affordable medium for anyone who wants to try it out- unlike my brief foray into stone carving! I use a Fiskars Fingertip Craft Knife holder, a rotary mat so I don’t destroy my table, a pencil, a ruler, some tape and a piece of paper. Oh, and thousands of Excel #11 Blades. I honestly find it really meditative. I think that’s a big part of what brought me back to it while I was teaching in Philly. My studio is very quiet and gives me room to reflect when I need it. Unlike a room full of kindergartners, I find paper very easy to control. It does what I want and it doesn’t argue with me! I do sometimes get frustrated when it seems like something is taking much longer than expected. That mostly happens with trees and brick. I hate cutting trees. My husband will tell you that my least favorite question is “Are you almost done with that cut?” I DON’T KNOW! I never know! It’s why I never time myself anymore. Q: In your opinion, how important can art be to a community? I really think art is the sign of a healthy community. Any place without art has given up hope. I mostly work in isolation, but last summer I got to teach at The Guild of American Papercutters Conference in Portland, Oregon. I loved seeing how excited all the artists were to share what they’ve been working on, what tools and tricks they’ve picked up. I tried my hand at scissor cutting for the first time! It was a lot of fun to be part of that community and see how much art means to all of them. I suppose it validated how much of my time I devote to it. When I heard this question I tried to think of where I’d been that was lacking in arts. The first thing that came to mind was Kensington, Philadelphia which is sometimes referred to as the Heroin Capital of the East Coast. When I taught kindergarten there we were asked to give families these surveys and one of the questions was “What do you like about this community?” The answer was always “nothing” or a laugh. They were too focused on the need to “Get By,” the title of my cut of Kensington which will be on display at Night Owl Gallery beginning April 5th, to even have hope. I think art shows that people are working to make their corner of the globe more beautiful. To share your art publicly can be a risky thing, but doing so shows a certain level of trust which is community in and of itself. 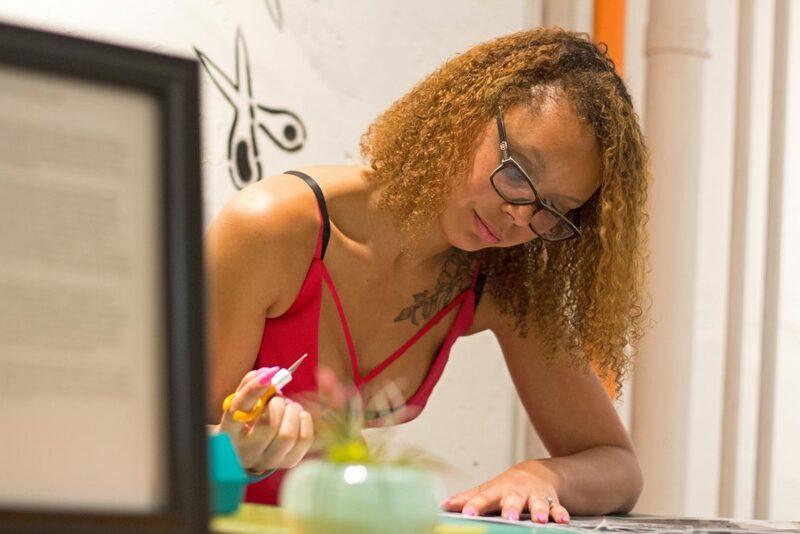 Q: Are you excited about your gallery take over at this week’s Highlandtown Art Walk? I’m very excited! My husband, our chihuahuas and I moved to Baltimore at the end of October. As soon as the last box was unpack I started checking out galleries in the area and trying to acquaint myself with the arts scene. I emailed Beth-Ann Wilson, owner of Night Owl Gallery and asked if I could bring her some of my work. She was immediately enthusiastic! In general, I have found the Baltimore arts community to be super welcoming. I’ll be hanging a big variety of my styles which I haven’t done before. I can’t wait to see how people respond to it and am excited to check out everyone else’s work during the Art Walk! Rosa will takeover Night Owl Gallery (248 South Conkling Street, Suite C) starting this Friday, as a part of the Highlandtown Art Walk!